"After Trojan folded, Hal Atkins apparently started another company called Dragon Engines in Los Angeles. While it had a number of detail changes, its Trojan ancestry was quite clear." Compilation of engineering drawings for the construction of model aircraft engines. Background note from the contributor: "I am a member of a small but now inactive group called The Motor Boys International. 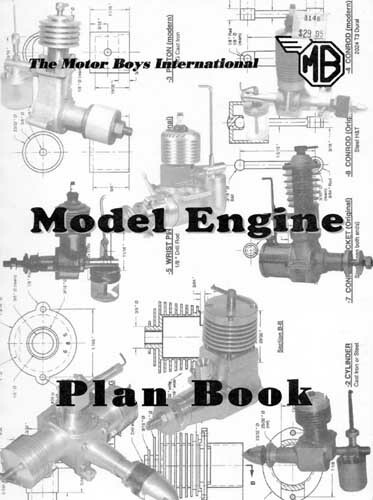 As part of our activities we compiled a book of engineering drawings for the construction of model aircraft engines. This book was published and sold by the AMA (Academy of Model Aeronautics) in 1997, and profits from the sales went to support the junior membership of that organization. The book is now out of print and unavailable. The web site of our Motor Boys Group www.modelenginenews.org still exists but is frozen due to the untimely death of its compiler, our member Ron Chernich. In the editorial of the penultimate monthly update of the web site in November, Ron decided that in the last issue on December 2003, he would make the book available to all in pdf format. Sadly Ron's health was such that although the December 2003 issue was published, it did not include the pdf version of the book. There are few surviving members of our group, but we are agreed that making the book freely available is a good thing to do. There were two editions and there were a number of additions and corrections that appeared over time. I have scanned my [first edition] book and added the additions and corrections which turn it in effect to being like the second edition, only better. I have compiled all the pages into a single indexed pdf file." Thank you Ken for making this available once more. It will be a lasting credit to you and the other Motor Boys.